The Creekside Cabin includes all of the key items on your "must have" list for a perfect ski vacation! The choice location allows you to quickly run home for lunch or a break and return to the slopes in no time. The close proximity to the ski lifts also affords guests a great view of skiing while relaxing in the living room or on the deck. With 3 bedrooms (5 separate beds) and 2 full bathrooms, Creekside is an excellent choice for groups of singles as well as 1 or 2 families with kids. The open and well-equipped kitchen is a wonderful layout for cooking with larger groups. The "chef" can flip pancakes and serve across the bar while taking in the views from the window lined living room. Both the pool table and ping pong table get equal enjoyment in the course of a weeks' stay and provide hours of entertainment. To top it off, the living room's gas fireplace creates a focal point for those socializing into the late hours of the night. Creekside simply has it all! We thoroughly loved our stay. There is amazing direct access to the ski lifts (ski-in, ski-out) and to Brighton Lodge. The house layout is perfect for one family or several families to enjoy the mountain lifestyle. 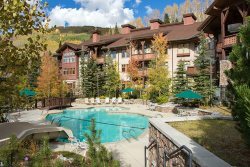 Whether you want to ski all day and night, relax on the deck, cozy up by the fire, play pool or ping-pong, or cook a huge mountain feast... this place has all the choice amenities. Our family cannot wait to return to Creekside! Creekside home was perfect for my group of 5s week stay. Walking distance to Brighton which made skiing there even more great. The house was stocked with everything we could have needed and would highly recommend staying here. Looking forward to coming back in the near future! Excellent place to stay. Kitchen and lounge areas were great to hang out in. Comfy beds and super clean.